MyACKKE app is 95% ready, so the company opens its doors to eager investors to be part of it, through crowdfunding platform - KICKSTARTER -offering products as a reward. The platform allows you in few steps to create funny cartoon characters of any person. Also you can add a message and then print on T-shirts, bags, labels and much more. The popularization in social media has put the emphasis on self-expression. As never before, each individual can show their personality and ideas in all circumstances. Therefore, MyACKKE users - young or adults - can create a cartoon character that looks and express itself like you. In a few steps you can choose from infinite combinations of skin complexion, eyes, mouths and hair styles to achieve the perfect resemblance to the person you want to "draw". Subsequently, the system allows you to choose clothing, locations and messages that complement the "finish" of this original and funny design. The same can be printed in labels, stickers, cards, T-shirts, bags, picture frames and party kits, plus much more products in the future. 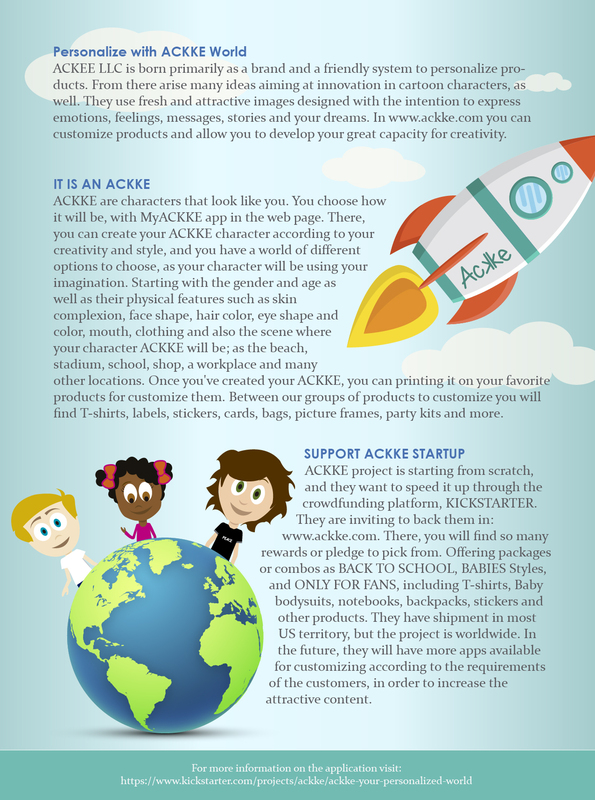 ACKKE Team expects to attract attention of Parents, Coffee lovers, Music and TV fans, and everyone whom want to express their feelings, mood, or ideas. The products could be deliver worldwide and the payment can be made with any credit card or Paypal. With MyACKKE everyone will be able to personalize their resemblance with stories, moments, experiences, messages, or simply place their name on belongings. MyACKKE will be available in http://www.ackke.com, it is a responsive web page, and can be visited in any device from PCs and laptops, tablets and smartphones. ACKKE is still in development. The project is 95% ready and is expected to be finished later this month. 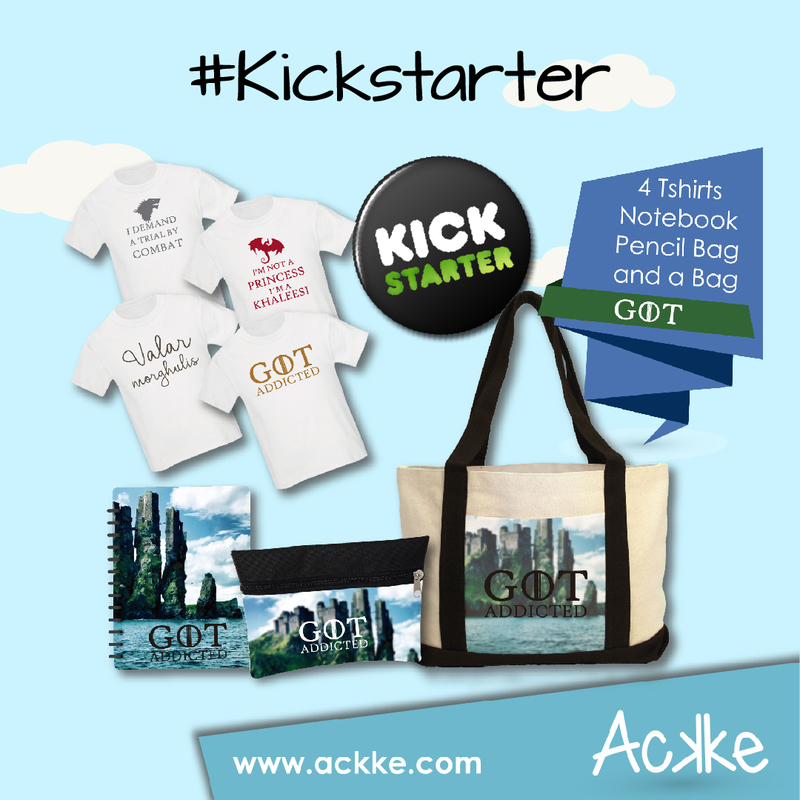 However, ACKEE LLC opened its doors to new investors who believe in this idea, using for them crowdfunding platforms – KICKSTARTER -. "We are generating all of our content: applications, designs, characters and stories," says Hugo Mora, General Manager of the project. "We dream to help our users to express their ideas, moods, feelings with our products; through simple customization that we can offer ", he added. 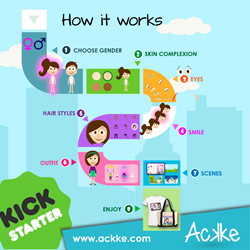 ACKKE believes in the crowdfunding as investment model. The intention is to offer packages in lines like "BACK TO SCHOOL 2016" with customizable items like backpacks, t-shirts, notebooks, stickers and more, which will be in tune with the desired investment offer. "There will be investment rewards from US $ 1 and onwards," Mora said. "The idea is that with pledges up to one thousand dollars to obtain several product packages, and let ACKKE share part of our customization experience" he concludes.